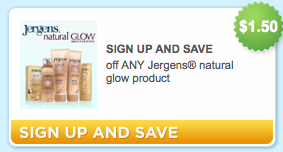 There are tons of new coupons up at Coupons.com now, and one that is sure to go quickly is the $1.50/1 Jergens Natural Glow product! Since there are no restrictions on the size of the Jergens Natural Glow product, you may use this coupon on the travel size that’s available at Target for $1.97. Final Price: $.47 after coupon! Please note: You will have to fill out a short survey in order to print the coupon, so if you don’t want to receive emails from them, be sure that you do not check that option! Anxious to try. Heard good things about this tanning lotion!